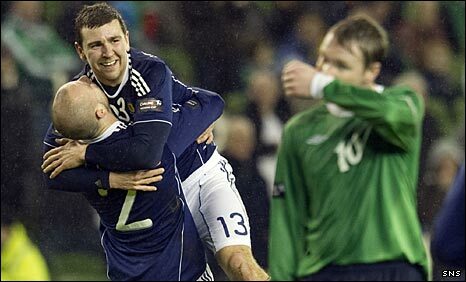 Scotland cruised to an impressive Carling Nations Cup win over a depleted N Ireland side in rain-lashed Dublin. Kenny Miller stabbed in the opener after 19 minutes and James McArthur added the second for the dominant Scots when his cross found the top corner. Kris Commons made it 3-0 with a classy goal on 51 minutes, netting from a superb Steven Naismith pass. 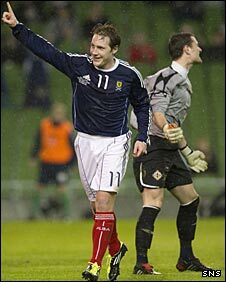 Scotland were also denied twice by the woodwork while Rory Patterson wasted a late chance for Northern Ireland. The Scots were forced into a late change with McArthur coming in for his second cap after Scott Brown was injured in the warm-up. It was a tight opening in front of a small but vociferous crowd and Northern Ireland were the first to threaten with Niall McGinn's low shot saved by Allan McGregor after 10 minutes. From here it was all Scotland, but Miller wasted their first good chance by side-footing over from a Commons cut-back. Miller made amends five minutes later, with Phil Bardsley flicking on from Charlie Adam's corner and the ball bounced off two Northern Ireland players before the Bursaspor striker slotted in from a yard out. Steven Caldwell's header clipped the crossbar from another dangerous Adam corner after 23 minutes and Gareth McAuley blocked a goal-bound Commons strike. There was a touch of fortune with McArthur's goal on 32 minutes, his intended cross drifting across and above keeper Jonathan Tuffey before nestling just inside the far post. Bardsley saw his fierce shot tipped over by Tuffey before the Sunderland defender had a penalty appeal turned down after being tugged back by McAuley. Miller and James Morrison went close with headers just before the break and Northern Ireland went in at half-time lucky to be just two goals down. David Healy was introduced at the start of the second half by Northern Ireland, but it was the other end of the pitch where help was required. It was a classy third goal for the Scots on 51 minutes, with Steven Naismith's defence-splitting pass giving Commons the time and space to tuck the ball between Tuffey's legs and into the net. Northern Ireland skipper Stephen Craigan was forced off with a hamstring injury, although his exit allowed Adam Thompson to come on for his debut. Scotland were denied by the woodwork for a second time when debutant Mark Wilson's deflected cross hit the outside of a post after 69 minutes. The game became disjointed as both sides made a series of substitutions, providing debuts for Northern Ireland teenager Liam Boyce and Scotland's Chris Maguire and Robert Snodgrass. The Scots remained dangerous in attack and Tuffey pushed over Barry Bannan's inswinging free-kick before Snodgrass fired wide. Northern Ireland finally carved out a clear opening with eight minutes left, but Patterson's weak header was easily saved by McGregor. Scotland: McGregor, Hutton, Steven Caldwell, Berra, Bardsley (Mark Wilson 57), Morrison (Maguire 79), Adam (Bannan 57), Commons (Conway 72), McArthur, Naismith (Snodgrass 58), Miller (Danny Wilson 90). Subs Not Used: Bell, Hanley, Gary Caldwell. Goals: Miller 19, McArthur 32, Commons 51. Northern Ireland: Tuffey, McArdle (Hodson 46), Baird, McAuley, Craigan (Thompson 66), McCourt, Evans, Davis (Norwood 58), McCann (Healy 46), McGinn (Boyce 72), Patterson. S ubs Not Used: Blayney.